As the facilitator for the Church of Central Africa Presbyterian (CCAP) Chaplain Training Program, Jeremy Garbat-Welch is responsible for developing programs for training CCAP pastors and lay leaders in pastoral counseling and other skills required to effectively provide emotional and spiritual support to individuals who are hospitalized and imprisoned throughout the areas served by the CCAP. Luta works to support the implementation of Community Health Evangelism (CHE) programs within the CCAP. CHE is a strategy for addressing issues of community development, health, discipleship and evangelism through training and mentorship. Jeremy and Luta are based in Lilongwe, Malawi, and serve with the CCAP in Malawi, Zambia and Zimbabwe. The Presbyterian Church (U.S.A.) began its participation in God’s work in Africa when the first American Presbyterian missionaries arrived on Corisco, an island of present-day Equatorial Guinea in West Africa, in 1869. Traditionally the PC(U.S.A.) has been particularly concerned for the most marginalized people groups in Africa. While the continent has abundant natural resources, unjust economic and political systems have kept the people from enjoying their benefits. Africa is home to severe poverty, and millions lose their lives each year to the diseases that accompany poverty, such as malaria, HIV/AIDS and tuberculosis. The PC(U.S.A.) is working to address these problems with African partners through education, healthcare and community development ministries. The Church of Central Africa Presbyterian (CCAP) has a long history, with roots in the Church of Scotland, the Free Church of Scotland and the Dutch Reformed Church of South Africa. Training pastors to serve their burgeoning congregations is a major emphasis for the church. Congregations consist of prayer houses in multiple geographical locations. In some instances, pastors serve multiple congregations. Lay leaders are trained to take responsibility for preaching and pastoral care of members. Pastor-to-member ratios are as high as one pastor to 7,000 members. Each Church of Central Africa Presbyterian synod operates with extensive autonomy, conducting holistic ministry through departments, operating schools, treating children living with AIDS and providing care for orphans and vulnerable children. Public health work is increasingly recognized as an important emphasis to prevent disease and improve quality of life. Additional areas of emphasis include evangelism, ensuring training and support for the synod-wide Women’s Guilds and addressing challenges in society through Church and Society departments. 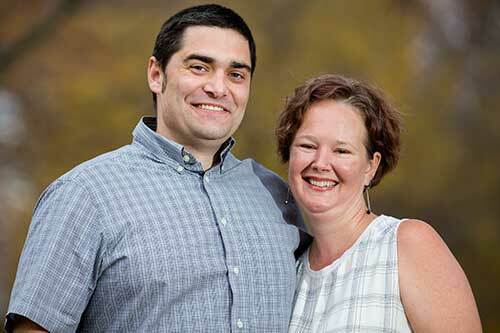 Luta and Jeremy serve on the continent where each of them heard a call to mission service. Jeremy felt a tug toward long-term mission service while working in Cameroon. He was involved in an 18-month mission assignment distributing donated computers and helping Cameroonian schools start or upgrade computer labs. As the son of missionaries in Africa, Jeremy experienced the continent as a child. “While we have always been open to wherever God would lead us in mission, we have always felt our gifts have been shaped by and for work in Africa,” Jeremy observes. Luta, who grew up in Africa as the daughter of Presbyterian mission co-workers, sensed a call at the age of seven to “love the least of these” as a mission co-worker. Jeremy uses his gift of listening to the hearts of those in pain and his hospital chaplain training and experience to develop trainings that nurture these gifts and skills in CCAP church leaders. Luta uses her gifts for facilitating positive change in communities and her public health expertise as she supports those working in Community Health Evangelism. Luta also works in the home caring for their two young sons. Luta’s parents are Doug and Ruth Welch, who served as Presbyterian mission co-workers in the Democratic Republic of the Congo and Malawi. Jeremy’s parents, James and Marla Garbat, served in Cameroon under appointment by the North American Baptist Conference. Prior to entering mission service, Luta served with Catholic Charities of Louisville as its statewide refugee health coordinator. She also has worked for Kentucky’s Department of Public Health as its lead immunization epidemiologist, as an immunization assessment coordinator and as an HIV health policy specialist. She earned a bachelor’s degree in biology from Whitworth College, a Presbyterian school in Spokane, Washington, and a Master of Public Health degree from Tulane School of Public Health and Tropical Medicine in New Orleans. Jeremy worked as a staff chaplain at the University of Kentucky’s Albert B. Chandler Hospital. He has completed clinical pastoral education residencies at Norton Healthcare System and Baptist Healthcare System, both based in Louisville. He earned an undergraduate degree from Whitworth College, with a double major in mathematics and computer science. He holds a Master of Divinity degree and a Master of Arts degree in pastoral counseling from Asbury Theological Seminary in Wilmore, Kentucky. An ordained Disciples of Christ minister, Jeremy is a member of Hurstbourne Christian Church in Louisville. Luta has been involved in two Louisville congregations, Hurstbourne Christian and Beechmont Presbyterian.